Nearing the end of the first semester of my last year at Heriot Watt, we have been working extremely hard. Long days and dark nights spent in the High Mill, somehow we have almost made it to the end of week 12! The time has passed so quickly, I have hardly realised how long I have been away for and now….it is December! I cannot wait to go back up North to Shetland for the festive season….I have missed it so much – time away makes me realise what a special place Shetland is. 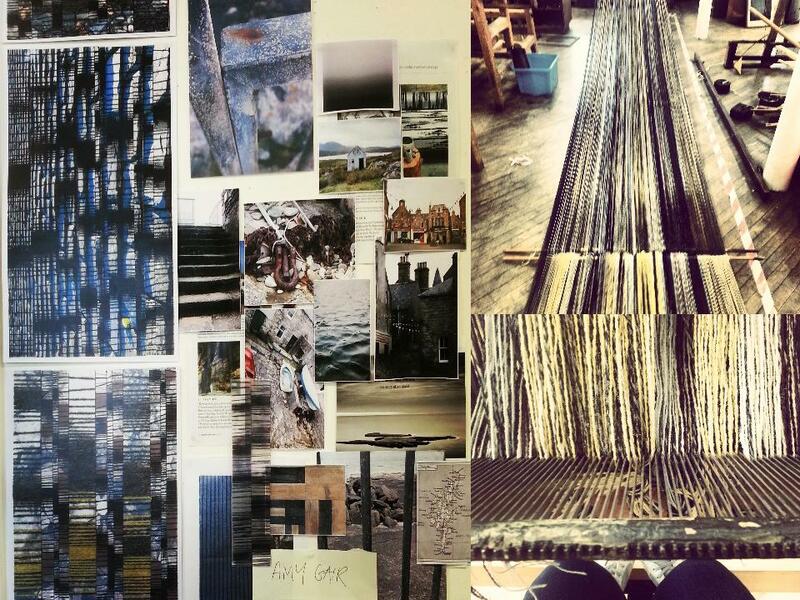 I have been busy weaving fabrics for my ‘Industrial North’ capsule collection which will be developed into my final collection next semester…and as much as I want a break for a few weeks over Christmas, I’d also be quite happy to continue weaving…..Definitely obsessed. 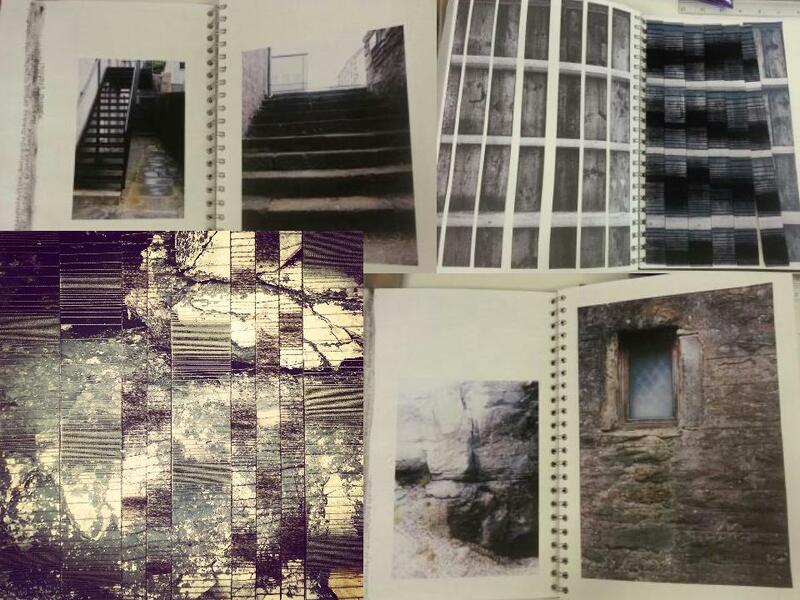 Here are a quick few pictures from my sketchbook and my loom showing the progress of the collection so far…….but trying not to give too much away! Taking my inspiration from my hometown in Lerwick, I took photographs over the summer of the things that make Lerwick, Lerwick to me. I love the cross of industrial and natural. And also the millions of geometric shapes and lines which are almost everywhere, and we take for granted. I love lines and geometric shapes……and have used them to develop my own style for years now. I have also been using Shetland wool in my collection and a combination of some other worsted wool’s all from the UK. It is really important to me to use Shetland wool, and also wool that is from the Britain, because ideally I want to support the ‘Made in Britain’ or ‘Made in Scotland’ social trend. These social trends we have been hearing a lot about recently, are actually a really exciting time for people like myself, and also the textile industry. Localised products have a story attached and are somehow more personal because they are made on the land we live on and not somewhere over sea’s. By buying local, we are supporting small independent business’s and the making of products and goods in our country. This can be applied to ‘Made in Scotland’ too and taking localisation one step further, ‘Made in Shetland’. To me, by using Shetland wool in my collection is it making a true Shetland fabric, supporting the local wool industry in Shetland and promoting wool as a sustainable fiber. I had some warp left over after I had finished sampling – and managed to weave a larger length, so keep an eye out for my post with my fabrics which I’m hoping to photograph when I’m back in Lerwick!